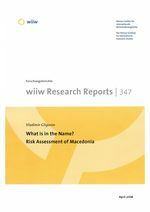 This paper assesses the possible political and economic risks of Macedonia failing to be invited to join NATO in the near future due to a Greek embargo. Three possible outcomes of the current negotiations are discussed and some narrowing down of differences is noted. It may, however, not be possible to arrive at a compromise in a short period of time and thus some negative consequences cannot be excluded. Those will be immediate, though mild, if the negotiations break down; in the medium and long run perhaps significant benefits will be lost due to higher risks to investment and overall higher uncertainty. Contrary to that outcome, an agreement and Macedonia's accession to NATO, and later to the EU, would have immediate and long-term positive effects. A continuation of the negotiations and some progress on integration would have beneficial political and economic impacts and may even have some positive effects on the chances for an eventual agreement on the name of the Macedonian state.